Real pirate relics are to be found around the coastline. This Tomb complete with the Skull & Crossbones carved into the Portland stone casing was discovered in a secret graveyard on the Penn estate overlooking the beach. The pirate ship foundered in the storm of 1782 off Portland Bill, Dorset. Pictured here is Liza Martin and her daughter Kelly. It is Liza's third find on the Pirate Trail with her father, Peter. The others were in Somerset, at Burrington Coombe, and Moorsands, Devon, so called after the Moorish pirates from Africa who struggled ashore from their shipwreck. See if you can find some more, wherever you live in the world and join in the" Pirate Trail" for relics. In July 1718 Captain Woodes Rogers arrived in Nassau, the Bahamas, as Governor. He ultimately granted amnesty to 2,000 pirates. 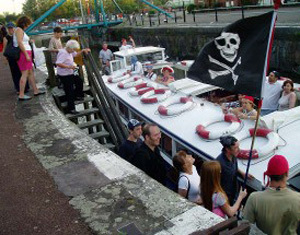 Given that Bristolians seemed to comprise about 10% of the pirates hanged, where the information is available, it is probable that some 200 pirates pardoned in the Bahamas were from Bristol or the West Country. Several killed in battle, maybe 20 hanged, 200 forgiven and many never caught. Blackbeard, or Edward Teach, Thatch or Drummond was the most famous Pirate to emanate from Bristol, but he is not the only one. He was killed by the Royal Navy in November 1718 in North Carolina. Of the 25 pirates that remained with the Bristolian Blackbeard and who were either killed or captured (and later hanged in Virginia) on November 18 1718, we can probably safely assume that Bristolians were represented, to the tune of at least one or two. Henry Virgin hanged at White Point, Charles Town, South Carolina on November 8 1718 Stede Bonnet left Blackbeard in June 1718 with a gang of pirates that Blackbeard cut loose. They robbed some ships and headed south with their vessels. They took shelter in the River Fear at Cape Fear, North Carolina. By happenchance they were attacked and captured by a detachment from Charles Town, South Carolina, who were looking for Charles Vane. In the battle, 7 pirates were killed and 35 captured. About half of Bonnet's crew were from America or Jamaica, and half from Great Britain. At least 9 were English, 5 Scottish, 1 Irishman and there was a Dutchman, and a Portuguese. On Saturday November 8 1718 23 of them were hanged at White Point, Charles Town, including Thomas Price and Henry Virgin, both from Bristol. A further 26 were hanged at the same place in December 1718. Bristolians were probably similarly represented. Captain Charles Johnson tells us that Edward was born in Bristol. Probably the son of a sailor who had sailed out of Jamaica for several years and had returned to Bristol in about 1680 where his son was born. Young Edward Thatch grew up in the streets around the river docks and the sea was in his blood. He probably lived in the congested Redcliffe area just a few yards from the working waterfront. The Thatch family was not poor; Edward received some education and he was later able to read and write. One legend has it that Edward Thatch’s father died in Bristol in 1693 and his mother re-married soon after. The man she married hated his step-son and beat him unmercifully on numerous occasions. After one beating, at the age of 16, Edward turned the tables on his step-father and nearly beat him to death. He had no choice but to leave home, and he ran to the Bristol docks, where he signed on as a cabin boy on a ship bound for Jamaica. In 1699 Edward Thatch may have been working as a sailor on ships sailing from Port Royal, the huge natural harbor that is Jamaica’s main port. Port Royal was rebuilding from the devastating 1692 earthquake and marine commerce was booming. Some 250 ships sailed into Port Royal harbor every year. This was second only to Boston, Massachusetts in British-America. Edward Thatch may have sailed on merchant ships sailing between Port Royal and the other islands and the American Main. He is known to have visited Philadelphia many times. In the Queen Anne's War (1704-1713) he was a seaman and a privateer, possibly with Henry Jennings. At the end of the war he moved to New Providence in the Bahamas. Once there he turns to piracy under the tuition of Captain Benjamin Hornigold. He spent over a year (1716 and 1717) with Hornigold. He visited Philadelphia several times, a city run by Bristol's Penn and Markham families, and they robbed many ships trading into Chesapeake Bay. He built a tower in Nassau in the Bahamas, with the money he had made seizing about 40 ships. In November 1717 they were in the Caribbean, which was usual in the winter months. Blackbeard, America's most famous pirate, was born in Bristol in 1680. He was killed near Okracoke Island, North Carolina, in 1718. Besides marrying 14 times and siring 40 children, he achieved his reputation as the most infamous pirate of all time due to his appearance & height, with his bulging eyes and he put lighted tapers into his mass of black unruly hair. He wore a long black coat bristling with 6 loaded pistols tucked into his belt, drinking rum laced with gunpowder. He was a formidable sight. 1. November 28, 1717. Blackbeard and Hornigold capture Le Concorde de Nantes and Blackbeard renames it Queen Anne's Revenge. It was a huge slaver and he was soon sailing in the Caribbean with three sloops and up to a total of 400 men on board. Hornigold retired and Blackbeard was now the commander. 2. December. Captures and burns Great Allen. 5. March 1718. Takes Adventure and Protestant Caesar, which is burned. 7. Takes several ships in the Gulf of Mexico. 8. April 1718. Visits Nassau. 9. End of May 1718. Week long blockade of Charles Town, South Carolina. 10. June 10, 1718. Queen Anne's Revenge runs aground entering Pamlico Sound and is abandoned near Beaufort, North Carolina. 11. July - October 1718. Blackbeard settled briefly in Bath, North Carolina, and married his 14th wife. However he soon attacks ships again off the Chesapeake. 12. November 22, 1718. Blackbeard is killed by a British Navy force at Okracoke Island, North Carolina. In April 1718 Blackbeard rejected the offer of the Kings Pardon from Woodes Rogers the new Governor of Nassau. From there he sails north to first blockade Charles Town and then stay the summer in Bath, North Carolina, where he knew Governor Eden. He was ambushed by the Royal Navy and decapitated off Okracoke Island, North Carolina, in November 1718 . His skull has recently been rediscovered and has been fashioned into a drinking cup. After Blackbeard, or Edward Teach was killed and decapitated in November 1718 his skull was hung for many years from a pole at the confluence of the Hampton and James rivers in Chesapeake Bay, Virginia, America. The site is still known as Blackbeard's Point. Perhaps the skull weathered away or was shot at and broken up after it was stuck up on the pole which was usually the fate of such relics. 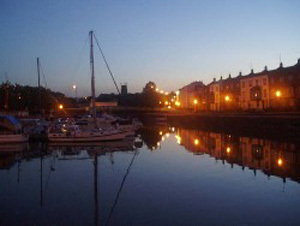 James Skyrm sailed from Bristol in the summer of 1720 as First Mate on the Greyhound. Bartholemew Roberts, the Welshman, captured the Greyhound, a Bristol vessel, off Africa in October 1720. James Skrym, from Somerset, was first mate and he joined the pirates, with enthusiasm. Skrym was put in charge of a ship renamed the Ranger. In the next year, in consort with the Royal Fortune they attacked many ships, including the Phoenix, the York, the Jason and the Mercy from Bristol, and they added crewmembers with every capture. The largest brewery in Bristol in the 1640s was owned by John Yeamans.One of his sons founded Charleston, South Carolina, and another was Mayor of Bristol. In the early 1600s John Yeamans owned Bristol's largest brewery. It was much later sold to the Saunders family, who ran it for a hundred years. It eventually became the Georges' and then the Courage Brewery. Yeamans had 13 children, John was the eldest (born in 1610) and Robert was born in 1616. Sir John Yeamans (as he later became) was one of the early settlers to prosper on the Caribbean island of Barbados. He owned a sugar plantation in Barbados. He married his second wife in 1650 in very despicable circumstances. He poisoned her husband, Col Berringer, married Margaret, and acquired their estate. In 1663 along with several residents of Barbados he purchased from the Indians a tract of land thirty-two miles square on the Cape Fear river, North Carolina. Sir John was appointed their governor and in the autumn of 1665 he arrived from Barbadoes with a band of emigrants and founded a town. However in 3 years it failed and was abandoned. Yeamans returned to the West Indies. In 1670 with three ship-loads of emigrants that had arrived from England Yeamans founded a settlement further south at Charles Town on the Ashley river for the 8 Proprietors that the King had bestowed the land rights upon. John Lock, Sir John Yeamans, and James Carteret were created landgraves. Yeamans would have become Governor, but he is listed as the 3rd Governor only because he did not arrive with the original settlers. He arrived several months later, and the 80 yr old governor Sayles he appointed in his absence had died. He then had to remove Sayles' replacement and he then took over. In 1671 Dutch emigrants arrived from New York and others from Holland, and Sir John arrived from Barbadoes with 200 African slaves, the first that were landed in any numbers on the North American continent. He imported the slaves to grab the largest plantation, qualifying for an additional 100 acres for each slave. Sir John Yeamans was not a good governor. He proved to be "a sordid calculator," bent only on acquiring a fortune. He only enriched himself, exporting food during a shortage. In 1674 Yeamans was removed from office. He died of disease in Charles Towne in August 1674. His descendents (the Moores) became very prominent in the following half century and his son and his descendents became slave dealers. Yeamans’ brother Robert was the Sheriff, Mayor (in 1669) and Chief Magistrate of Bristol, as well as a ship owner and a merchant, who had an early involvement in the Caribbean trade. Redland Court was owned by Sir Robert Yeamans in the 1680s. He died childless. Sir John’s grandson, Colonel Robert Yeamans of Barbados, eventually inherited Redland Court. William Penn was born at Bristol in 1621, of the ancient family of the Penns of Penn Lodge, Wilts. He was Captain at the age of twenty-one; Rear-Admiral of Ireland at twenty-three; Vice-Admiral of England and General in the first Dutch war, at thirty-two. He was subsequently M.P. for Weymouth, Governor of Kingsale, and Vice- Admiral of Munster. He was a highly successful commander, and in 1654 he obtained possession of Jamaica. He was appointed a Commissioner of the Navy in 1660, in which year he was knighted. After the Dutch fight in 1665, where he distinguished himself as second in command under the Duke of York, he took leave of the sea, but continued to act as a Commissioner for the Navy till 1669, when he retired to Wanstead, on account of his bodily infirmities, and dying there, September 16th, 1670, aged forty-nine. He was buried in the church of St. Mary Redcliffe, in Bristol, where a monument to his memory was erected. William Penn is known, of course, as the founder of Pennsylvania. He is also known as a famous Quaker and for his 'Great Treaty' with the Delaware. However, Penn did not name his colony after himself (as he feared would be assumed), but after his recently departed father. He had wanted to call the colony 'New Wales' or 'Sylvania' but King Charles II intervened, suggesting instead 'Pennsylvania'. Popham, Maine In 1606 King James I granted a charter to the Virginia Company to colonize the North American eastern seaboard. This was very soon after sub-divided into the London Company, which would colonise the southern coast, and the Plymouth Co the northern portion. Sir John Popham was born at Huntworth, in Somerset, about 1531. He attended Balliol College, Oxford, and became a judge and a member of Parliament. He was the Recorder of Bristol, and its M.P. from 1571 to 1583. He became attorney-general and later Lord Chief Justice in 1592. He presided at the trials of Sir Walter Raleigh and Guy Fawkes. Late in life he took an interest in colonization, and with others procured patents for the London and Plymouth Companies for the colonization of Virginia. Popham saw it as an opportunity to transport abroad convicts. He sent out an expedition in 1607 under the leadership of his brother and his nephew on board and to set up the Popham colony, in Maine, on the Kennebec River, about ten miles south of Bath. One hundred and twenty colonists and sailors established the first English colony in New England. The London Co set up Jamestown, Virginia in the same year. However, Popham failed. Before the end of December both ships returned to England leaving 45 colonists behind. Nobody was prepared for a winter that was so early and severe. After a year they built a ship themselves and sailed back to England. Popham died in June 1607, and is buried at Wellington, Somerset. The actual founding of a permanent New England colony was in 1620 when the Pilgrims established a settlement in Massachusetts Bay. was greatly pestered by cats and rats...At his first coming on board with us, he had so much forgot his language for want of use, that we could scarcely understand him." Upon returning to England, Selkirk was interviewed by the writer Richard Steele. His story appeared in the periodical The Englishman, and was a source of wonder for many. The bottom line: "he is happiest who confines his wants to natural necessities." Long John Silver was the ship's cook. Once you had lost a leg on board a ship it was the only job left and as such Robert Louis Stephenson portrayed him as the landlord of the "Spyglass Inn" in "Treasure Island". This famous novel was based on real people and locations, even Jim Hawkins the hero, Isreal Hands, and Benbow. Names which crop up in these brief notes. It is full of sea shells/giant clams brought back by Dampier from the south seas, on the woodes Rogers trip. Goldney, a small time grocer on Bristol bridge made so much money from his investment of £4000 that he built his Clifton mansion as a result and loasned felloe Quaker penn £6500 to finance the new colony in USA, holding the deeds as security. He then set up the copper works at the Baptist mills to get the contract tp produce fatheinf for the royal mint but lost out to politics. Golneys daughter marries champion, so they have their own fleet of slave ships going out of merchants quay, hotwells, which they built hence the dock gates and floating harbour. ACTIVE IN THE SEVERN Edward Stradling of Coity Castle married a daughter of Henry VI's great uncle Cardinal Beaufort and became Chamberlain of South Wales in 1423. 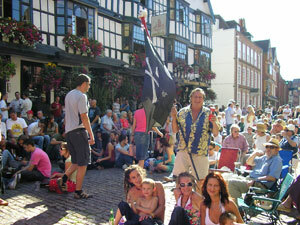 His son Harry was captured by the pirate Colyn Dolphyn a native of Brittany, . Operating out of Lundy Island, Dolphyn captured of Sir Harry Stradling in1449 while sailing back to Wales from Minehead in Somerset, where he had stayed for a month. Sir Harry Stradling, his faithful man Dewryn, and the crew of the St. Barbe, were kept close prisoners by Colyn Dolphyn, on board his barque the Sea Swallow for about 2 years. Stradling was ransomed for a price of 2200 marks and forced to sell his manors of Bassaleg and Rogerstone and other estates to regain his freedom. According to the old chroniclers, Colyn Dolphyn was a tall, athletic, and mighty man, "like Saul in Israel." He "towered head and shoulders" over the Welsh and English alike. Colyn Dolphyn's name was a terror in South Wales. Some time later Dolphyn was caught in a storm and ran aground on Colhugh Beach and the Nash rocks in Glamorgan. The Old Bank in Corn Street, Bristol, was the first bank established in the city, in 1750. Two of the founding partners, Merchant Venturers Onecipherous Tyndall and Isaac Elton, had interests in the African and Caribbean trades. In Bristol, many of the directors of the early local banks had direct or indirect involvement in the slave trade. Slaving voyages lasted up to two years, and the ship carried a large valuable cargo on each part of the voyage. Money lenders might be needed to help investors buy the ship or the cargo, insurance was required to cover the possible losses, and banking systems were needed to transfer money from the Caribbean and America to Britain. Isaac Elton formed a partnership with O Tyndall who was trading in slaves. Their private bank was opened in Bristol in 1750 as Tyndall, Elton, Lloyd, Miller, Knox & Hale by a partnership of Onesiphorus Tyndall, a West India merchant and drysalter, Isaac Elton, Harford Lloyd, William Miller, a grocer, Thomas Knox and Matthew Hale, the managing partner. All but one of the bank's founders were traders to Africa. Originally called Bristol Bank, it became known as Bristol Old Bank from 1752. This was one of the banks that eventually merged into the National Westminster Bank. In the late 18th century The Old Bank moved to what is now the Wig and Pen pub. The bank issued banknotes until 1844. Anne HTB almhb@t-online.de wrote about the Tyndall family, seeking information on Bristol's aristocratic banker and Quaker. Subject: Re: Onecipherous Tyndall I found about O Tyndall coming from Bristol through a relative of mine. Then I contacted the Bristol Records Office and they sent me some information informing me that OT was a banker. I have a bit about him written in a family book and there is more about him in the records library of Falkland Palace in Fife which I have seen. All my family were quakers. His life dates were 1790-1855 and he married Margaret Stuart Hamilton Bruce in 1828. Her life dates were 1788-1869, She was the daughter of Robert Hamilton Bruce. Falkland Palace was bought by John Hamilton Bruce in 1820 and bequeathed to his neice Margaret on his death in 1826 as he had no heirs. OT was very luck to have married Margaret as he >was in great debt when they met (about £500 which was no small amount in those days) and Margaret cleared his debts. Whatever attracted a woman of enormous wealth to an impecunious slave trader beats me but then love has no eyes does it? She was a great worker and a very determined woman and I am sure is was she who made him a success in Falkland. He came from the farming family of Melksham Court, Stinchcombe, Stroud, who became well known when William Tyndall tutored to the Berkeleys at the castle. They translated the bible in 1536 into English from Latin and in fear of his life fled to Germany but was eventually hung for his efforts.